We need some brave souls to help us test the next version of PocketWGU for iOS. If you're willing to try out the app while we work out the bugs (and let us know what works or doesn't) please let us know via email (link at top of this page). Do you like using buggy, unfinished software? Do you believe that "bleeding edge" is always better than "leading edge"? If so, have we got a deal for you! 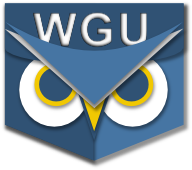 :-) Well... as long as you're an enrolled WGU student with an iPhone/iPad running iOS 7 or later.